The adventures of the protagonist Larry Laffer - a balding, double-entendre speaking, leisure-suit wearing man in his 40s - began in the late eighties with the first Larry game developed by Sierra Entertainment. Since the beginning of the franchise the story focuses on Larry and his mostly unsuccessful attempts to seduce attractive women around the globe. The story s very special humor and the new hand-drawn 2D graphic style have been reasons enough why the already released PC/Mac version of Larry s new adventure Leisure Suit Larry Wet Dreams Don t Dry was critically acclaimed and decorated with several awards. "Hey ladies, I m back in business! 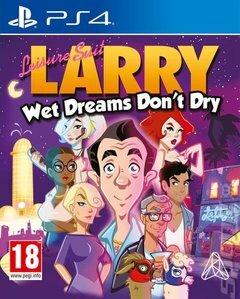 My new adventure, Leisure Suit Larry - Wet Dreams Don t Dry, takes me whatever the route or twist of fate from the end of the 80s directly into the 21st century and wow, how the world has changed! While my view of the world and women from way back in the 1980s collides with modern reality harder than the breasts of a lusciously stacked blonde jogging along a beach, I m all set to date my way across the modern world! "In a point &amp; click adventure I d call typical for the genre we mutually experience how I fall head-over-heels in love with Faith, the hot-to-trot assistant to the boss at Prune, a technology enterprise successful worldwide. Since even dating is done digitally nowadays, the first thing I have to do is to work on my score at Timber, the totally hip, can t-get-anywhere-without-it dating app where I date women, satisfy their needs, and accordingly pick up points for my Timber profile. And whenever I get a chance in between, always briefly check out a few new bikini pix at Instacrap the 21st century is gnarly smill!